Hats off to football site Off The Post for this excellent spot – which has now correctly attributed the spot to Keith Belfast’s blog. It seems the Mirror’s new football website, launched last month, gave an alternative match report for last night’s game between Liverpool and Aston Villa. 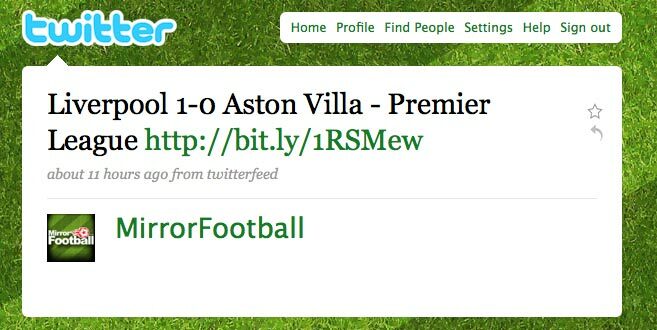 This entry was posted in Social media and blogging and tagged aston villa, Journalism. co.uk, Keith Belfast, Liverpool, mirrorfootball, MirrorFootball.co.uk, Twitter on August 25, 2009 by Laura Oliver. Mick Ricket, National Union of Journalists (NUJ) Merseyside branch chairman, has asked for an inquiry by the Competition Commission into regional newspaper ownership in the UK. This entry was posted in Editors' pick, Newspapers and tagged Competition Commission, Liverpool, Merseyside branch chairman, Mick Ricket, National Union, National Union of Journalists, Trinity Mirror, United Kingdom on November 28, 2008 by Laura Oliver. A day that saw plenty of job cut announcements. Here’s the roundup for this evening and Journalism.co.uk will update tomorrow. “The publisher has today entered into a consultation period with staff and said it envisaged 59 editorial jobs would be cut. 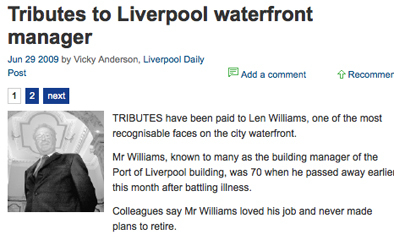 It said it was committed to voluntary redundancies where possible. The Telegraph: 50 jobs editorial jobs cut: Fifty editorial staff are to lose their jobs at Telegraph Media Group, management told staff today. “It is understood the cuts represent a 13-14 per cent saving to the editorial budget and will be brought into effect by Christmas at the latest,” reports MediaGuardian. 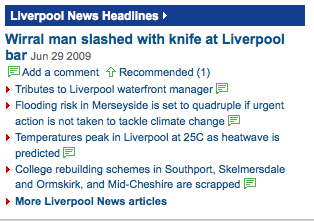 This entry was posted in Job losses, Jobs, Journalism and tagged Christmas, job cuts, Journalism.co.uk, Liverpool, Press Gazette, Reorganization, Telegraph Media Group, The Liverpool Daily Post, the Telegraph, Trinity Mirror, Trinity Mirror PLC on November 27, 2008 by Judith Townend. Trinity Mirror has implemented a company-wide pay freeze affecting all staff (that’s journalists and non-journalists employed by the publisher). Please follow the link to see the letter being sent today to all staff. We have all seen the severe impact of the economic downturn reported in the media on a daily basis. Unfortunately there doesn’t appear to be any sign of an improvement for the foreseeable future and there are indications that it could get worse before it gets better. What is clear is that the gravity of the challenge facing our business is unlike anything we have seen before. As a consequence of this economic climate, all parts of Trinity Mirror have seen revenues come under severe pressure as advertisers have significantly reduced their spending. In addition, our readers are also looking to curtail their spending with a consequential impact on our circulation revenues. This in turn is affecting our financial performance, and in particular the cash generated by the business. As previously communicated to you and the financial community, we anticipate that our profits will fall in 2008, with a further decline in 2009. Whilst we expect to remain profitable going forward, the fall in cash generated will adversely impact our ability to comfortably fund ongoing commitments such as interest payments on our borrowings, taxes, investment in our business (capital expenditure) and pension scheme funding. To partially address the constraints on cash we have already cancelled the share buy back and have halved the 2008 interim dividend paid to shareholders. The final dividend will also be reviewed by the Board in February. With our revenues considerably reduced, our priority has to be to safeguard the future of the Group. To do this we have done much already to reduce costs in many ways. So far this year, sadly, this has involved the announcement of almost 1200 job losses across the Group. We have also had to announce the closure of 44 of our titles, 40 offices and our print plant in Liverpool. We do want to do all we can to minimise any further job losses. I can also confirm now that our performance has been such that we will not be paying any bonuses relating to 2008. This goes for me; the Executive Committee and virtually all other managers. Nevertheless we need to take further steps to protect the future of our businesses. I have therefore decided not to hold a pay review for anyone in Trinity Mirror during 2009. This will apply to me, the Board, all management and employees of the Group. We all hope that the economic climate improves in 2009 and, whether it does or doesn’t, I know we will all perform to the best of our abilities. To recognise this, a special 2009-only incentive scheme will be introduced. In January, once we have a clearer idea of trading going into 2009, the Board will agree a target for this scheme. I can tell you that this target will be lower than the target set for profit sharing in previous years. The scheme is designed so that it could pay up to £1,000 to each employee (before tax) and will apply to all employees across the Group (see note below). Further details of the scheme will be communicated to you in January. I appreciate that the times we find ourselves in are some of the hardest in living memory. I ask for your support so that we can manage our way through it and ensure the long term survival of our business. Those not in receipt of contractual pay (i.e. casuals, or unauthorised absence). Staff that have taken part in industrial action during 2009 will not be entitled to any payment. New starters may participate and will receive payment on a prorate basis for full months’ service during 2009. Employees who retire or leave under redundancy will receive payment on a pro rata basis for full month’s service during 2009. This will still only be paid after auditors approval of the final results. Staff who resign their employment before end February 2010 (the date of the scheme profit calculation) will not be entitled to any payout. This entry was posted in Jobs, Newspapers and tagged chief executive, Executive Committee, GBP, Liverpool, Reorganization, Sly Bailey, Trinity Mirror on November 19, 2008 by Laura Oliver.